New Mind has been selected by one of the nation's favourite seaside destinations to deliver a brand new contemporary tourism website and e-tourism solution. Our new destination website will allow VisitNewquay to bring more business to the resort's tourism operators. VisitNewquay has tasked New Mind with the development of a new website, supported by their renowned e-tourism solution. VisitNewquay's primary objectives are to increase visitor numbers, maximise commercial opportunities, exploit the potential of social media, build on their existing consumer database and ultimately position Newquay as a vibrant and appealing resort. New Mind's new VisitNewquay site will differentiate Newquay from other UK seaside resorts, reflecting the destination's contemporary edge revolving around beaches, watersports, activities and high profile events. Newquay is not only the surf capital of the UK, with a line up of prestigious events to match but also home of the adrenaline rush, offering a huge range of extreme sports including kitesurfing, bodyboarding, kite buggying and mountain boarding to name a few. 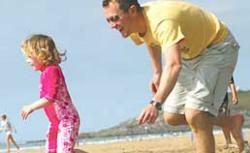 The new site will also feature Newquay's more relaxing persuits such as walking, cycling and fishing as well as the more family friendly activities which are available in abundance. Managing Director of New Mind, Richard Veal comments "We are delighted to have been selected to promote Newquay's rich and exciting tourism offering and we are confident that the new site will allow this great destination to maximise its true potential." Steve Kessell, Business Development Manager at VisitNewquay comments "Our new destination website will allow VisitNewquay to bring more business to the resort's tourism operators, not only through integrated digital marketing campaigns including social media but also through the commercial marketing opportunities the website will bring. We will be able to partner major events such as the Boardmasters Festival by providing our accommodation and other data direct to their sites. Communicator will bring huge new eCRM opportunities as well as giving us a platform for regular newsletters and most important of all the integrated social media and online booking will bring Newquay to the attention of many more potential visitors at all times of the year." The site is due to go live during Spring 2012. New Mind is an award winning technology provider with expertise ranging from the implementation of sophisticated e-tourism solutions to the development of high performance destination websites. The company’s e-tourism solution is a suite of software applications designed to enable and support every area of a tourism organisation’s management promotion and fulfilment, with a central product, business and visitor database at its core. New Mind’s integrated offering includes website design and development, destination management systems, content management systems, online marketing and mobile applications. The company has achieved success overseas with the appointment of resellers in Italy, Spain, Sweden and Finland and the acquisition of a prestigious contract with the Costa del Sol Tourist Board.